This post first appeared at Greenz on October 25, 2010,and I've added a few links here and there to recipes or updated information. The Shinonome Market is being held again on Saturday, July 9th, and is just one of the many markets happening this month. This ought to whet the appetites of market goers but good! The Earth Day Market in Yoyogi Park is one of the monthly food events not to be missed if one is a fan of local, organic food. Fresh vegetables, amazing baked goods, tasty jams, miso, rice, and so much than one good sentence can hold can be found there. Yet, there are times when a vegetable adventure is also in order. 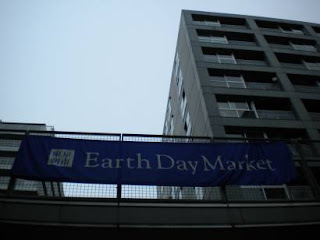 This time we grabbed our shopping list and headed out to Shinonome's little Earth Day Market. Snuggled at the base of an amazing conglomeration of looming apartment buildings between the Rainbow Bridge and Tokyo Big Sight, the tiny market did not disappoint. Ducking under the signature blue and white banner we found six vendors (usually there are ten but inclement weather lowered numbers a bit) offering all a shopping locavore might want - seasonal fruits and vegetables, rice, miso, and jams - for at least a week's eating. (Or less, depending on one's appetite.) Winter squash, herbs like shiso and lemon grass shared table space with green yuzu, honey, homemade umeboshi, miso, shungiku (edible chrysanthemum greens), and a bundle of others. 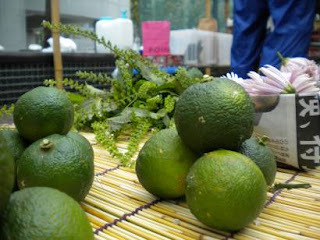 Perhaps my favorite discovery - other than a recipe for yuzukosho combining green yuzu and hot peppers - were natsume. 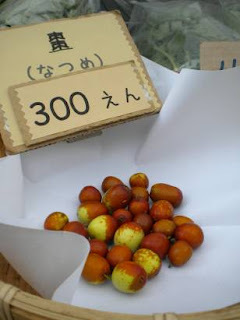 These tiny oblong fruit with the taste and texture of apples are the fruit of the camphor tree. Utterly delightful, I have no idea what to do with them except chomp on them (watch for seeds!) and savor the flavor of one of the more unique fruits I've met yet. Tucked in my bag at the end of the day were a handful of Shizennouen's shungiku along with half a dozen eggs from Miyamotoyama Farm, some green yuzu and a small bundle of lemon grass. I managed somehow or another to resist Totokawa's brilliant jams, but I'm regretting it a bit now. 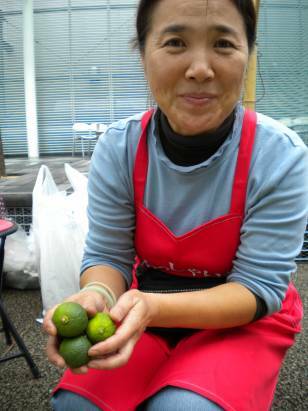 The peach still calls to me and the October market in Yoyogi may be a destination yet!